The Stone Roses sold out their two outdoor reunion shows in just 14 minutes this morning. All 150,000 tickets went shortly after they went on sale at 9am as desperate fans swamped the booking website with applications. 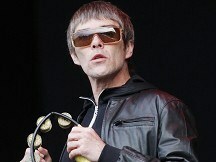 Now promoters have added a further show at the same location, Manchester's Heaton Park, on July 1. The much-missed band announced they were reforming earlier this week after singer Ian Brown and guitarist John Squire patched up their differences. The pair had not spoken for many years, following Squire's departure from the band in 1995 and its eventual demise the following year. They have been rehearsing over the past few weeks and also working on new songs, along with original members Mani and Reni. They announced Heaton Park shows on June 29 and 30 as a taster for further dates still to be announced.